Continuously bridging the gap between the 'virtual casino experience' and that of land-based casinos, many online casinos now offer games with live dealers. With streamed casino games – such as roulette and blackjack – you’re able to reproduce the live casino feeling right in your own home. Below we list the best live casinos online. Online casinos have offered live dealer tables for certain games for years (most notably blackjack, baccarat, and roulette). What was once a niche offering only found at a few sites is becoming more and more common. Software provider Microgaming announced that sites powered by its software including Platinum Play and Royal Vegas Casino would be rolling out live dealer tables, offering players the option of taking a seat at a table with a live dealer. The increase in live dealer tables also corresponds with the recent push by some poker providers to incorporate the same idea into selected poker tables that require players to use Web cams, with the goal of offering a more "realistic" poker experience. While it may seem a bit odd at first glance to try to re-create the live casino experience at online gambling sites (as the obvious rejoinder would be to just go play at a casino if you enjoy that more) there does seem to be a niche and demand for the offerings, and it's important to keep in mind that some players don't have easy access to a local casino. The concept is a simple one; while you're playing online you watch a dealer via a video feed that deals cards or spins the roulette wheel, with the action unfolding in front of you live instead of via computer animations and graphics like standard online games. If you're playing blackjack, the dealer will deal the cards and wait for your decision to hit or stand, so the game is very similar to playing live at a casino in Vegas, Macau, or other gambling destination. With the use of webcams and real-time technology, several different online casino operators are employing live dealers for many of their most popular games. Depending on your game and interest(s), instead of receiving a card directly on your screen, you can now be dealt the same card from the hand of a real person. Obviously, this is far more interactive than looking at computer-generated characters. Of course, considering technology, it's not difficult to develop a program where a real person deals you a card when you click on the screen. Although, the difference now is that the person is not part of a program but instead hooked up to your game in real-time waiting for your instructions! Playing at live casinos is an interesting alternative for many players and is increasingly becoming a benefit many casinos are seeking to provide their customers. Of course, like all things, there are pros and cons of both to be aware of. Read below to understand what they are so you can decide whether playing the live casino version of your favorite game is something you are truly interested in. You can forget your suspicion on being cheated on by a faulty random number generator and casino software as the dealer is a person who is handing out the cards right in front of you in real time. You also have the benefit of being able to chat with the other players at your table, as well as the live dealer, so it will be just like the real casino where you can bond with the other players. Technology has also advanced significantly and the experience is more cinematic these days than it is grainy like in years past. Naturally, games such as this are slower than those controlled entirely by software and the computer. There is a possibility you'll have to wait impatiently for slow players to make a decision just as you have to in a live game. 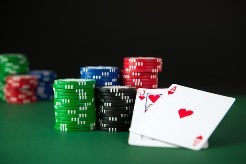 If you play for high stakes, you should also be prepared for the consequences if your Internet connection drops; unlike standard online games if you time out your game won't be stored at that point, so the hand continues even if you don't make a decision in the allotted time you have. This is much more an issue with blackjack than other live dealer games such as roulette and something to consider before taking a seat at the live dealer tables. Drawbacks aside, the live dealer games continue to grow in popularity, and it's easy to see why, as they not only offer a unique change of place but also a more social experience as well, and one much closer to the live action in a casino. Players can chat with each other as well as the dealers, and some casinos that offer live dealer games obviously make an effort to hire outgoing dealers who try to make sure players are enjoying themselves, regardless of whether they're winning or losing. As the technology improves, we shouldn't be surprised to see more and more operators increasing their staff of live dealers and making such a playing option more readily available to their clients. If you’d like to play live games online, choose one of the casinos listed above. They’re simply the best live casinos online right now. Just like its counterpart at the brick and mortar casino, you play live dealer baccarat at a table with other players. Of course, the only person you will see on screen via the webcam is the dealer, but you can chat with all the other players at the table using the chat function. The game happens in real time and the dealer will deal the cards once all players have placed their bets on one of the three outcomes. Online roulette is a wildly popular casino game in the brick and mortar casino, at online casinos, and now the live casino version is really kicking off. When you play live baccarat you have a live dealer spinning the wheel and you watch the ball bounce around in real time. You click on the bet you want to make on the screen, and then the dealer will place your bet for you in front of your eyes. The main live baccarat variations you will find at online casinos are live European roulette, live French roulette, live VIP roulette, and there may be some others, depending on the online casino and whether they have specialised in growing their live casino offering or not. If you’re a fan of playing Blackjack either at the regular casino or online, then you will love live dealer Blackjack. It’s one of the most popular of the live casino games. Instead of playing against the dealer like you would when you play the online casino version, you play against the other players which more closely resembles the real thing. Are all games available in the live dealer version? No, not all games are possible to do live. It is typically games such as Blackjack, Baccarat, Hold’Em, Roulette, and Sic Bo which transfer nicely to the live casino version. With games such as craps or live casino slots it’s not possible for a dealer to do all the actions. Can I play live casino games on a mobile device? A few years ago this was impossible, but with the current advances in technology some software providers have now developed the software to play live casino games directly from your mobile device! You will need to check with the online casino you are playing at to check whether it’s possible to play at online casinos with live dealers. Your best bet is to go for the online casinos that partner with all the biggest online casino software companies which have the power behind them to develop the live dealer casino mobile technology. How do I place my bets at a live casino online? It’s very easy to place a bet when playing a live casino game. You need to make sure your account has funds in it first, which you can do by crediting your account with one of the available payment options. The betting is done just like in a regular online game, by clicking on the correct button on your screen, sometimes this is done with a timer on when there are multiple players. The dealer will then place the bets on the table, and your online casino account will be credited by the dealer if you have any winnings. Can I interact with other players and the dealer when I play a live casino game? This is one of the best parts about playing live casino games. You get to use the chat function to get to know the other players playing at the same table as you, and you can even send messages to the live dealer who will respond to you by chatting into the webcam. If you have been playing online casino games but missing the excitement of a real casino, then playing live casino online is the perfect solution! You get the very best of both worlds, playing from home (or from anywhere) at your own convenience, plus the atmosphere of the real casino. Choose an online casino featuring the best live casinos from our toplist to start playing!